Lazer Grille Kits allow for the stylish and sleek integration of Lazer High Performance LED driving lamps contained within a bespoke stainless steel front grille, which perfectly fit the contours of your vehicle. 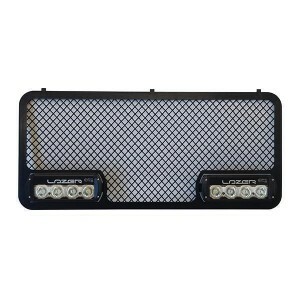 With matching secondary grille elements available; the design and look of your vehicle is enhanced while delivering superior auxiliary lighting performance that has become synonymous with the Lazer brand. Grilles are a woven mesh made from 316L stainless steel, and are electro polished, or coated with a black nylon polymer to provide a long lasting bright finish with no risk of paint flaking or chips. The grille kits come supplied with 2x Lazer ST-4 lights pre-mounted, and with a two-lamp harness kit with fully waterproof splice system for wiring into the vehicle electrical system without risk of damage or corrosion. The grilles themselves are easy to fit with bespoke fittings and comprehensive instructions, and because the grilles are custom-made the grille and lights will always remain secure and safe.